Food prices have been rising since 2003. By mid-2008, the food commodity price index peaked at 230 percent of its 2002 value, with most of the increase due to the grain prices. Corn and wheat both reached 350 percent and rice 530 percent respectively of their 2002 values . The United Nations declared 2008 the year of the global food crisis even before prices peaked , and an estimated 150 million were added to the world’s hungry that year . Although food prices have fallen from their peak, they remained well above 2002 levels;. By the end of 2009, more than a billion people are critically hungry, with 24 000 dying of hunger each day, over half of them children [3, 4]. The UN Food Programme faces a budget shortfall of US$4.1 billion. The UN’s special rapporteur on the right to food Olivier de Schutter blames  “inaction to halt speculation on agricultural commodities and continued biofuels policies”, and warns of a rerun of the 2008 food price crisis in 2010 or 2011. What happened in 2007-8 was a “price crisis, not a food crisis”, he says, precipitated by speculation in the financial market that was not linked to insufficient food being produced. It would be a mistake to dismiss other threats to food production, notably the inherently unsustainable “green revolution” agricultural model that is highly dependent on rapidly depleting resources such as fossil fuels and water, and monoculture crops especially vulnerable to physical and biological stresses associated with climate change (see  ‘Land Rush’ as Threats to Food Security Intensify). Nonetheless, the disproportionate influence of the unregulated financial market on the real economy of goods and services (see  Financing Poverty, SiS 40) is most devastating for people’s access to food, a basic necessity. Food is produced by farmers everywhere in the world; but it is mostly bought and sold as commodities by ‘middlemen’, now mostly big corporations that trade globally, not just in a commodities market, but also in an elaborate financial derivatives market that pushes food prices up and creates price volatility. Commodities are the raw materials while ‘commodities derivatives’ are financial contracts derived from the value of the underlying commodity . At the bottom of the commodities derivatives is the ‘futures’ contract, which brings together buyers and sellers in a regulated auction market like the Chicago Board of Trade (CBOT) in the United States, to bid and settle a price for the delivery of a quantity of a commodity, say corn, at an agreed time (usually 90 days) and place. This futures contract enables commodity sellers, such as grain elevator operators, to avoid sudden price drops and commodity users or traders to avoid sudden price increases; and is generally regarded as a kind of insurance. But it ceased to work as such after the deregulation of the global agricultural markets. The deregulation of global agricultural markets was part of the economic deregulation driven by the World Trade Organization (WTO), the World Bank and the International Monetary Fund. It was a process initiated by the Breton Woods Agreements of 1944 to standardize international trade and marketing policies to facilitate global trade . It eliminated government intervention in agricultural markets, dismantling global commodity agreements, price supports, and other mechanisms that had helped stabilize global supplies and prices. The WTO’s Agreement on Agriculture, and other multi-lateral and bilateral free-trade agreements including the North American Free Trade Agreement (NAFTA), opened up markets in the developing world to an increasingly powerful global agribusiness industry. Farmers may have benefited from a windfall in higher prices paid for their produce in the short term, but they have had to pay more for inputs like fertilizers and diesel for tractors. Only big agribusiness corporations could profit from the long term rise in the market [10, 11]. Cargill’s 2007 third-quarter profits increased 86 percent, General Mills’ were up 60 percent, and Monsanto’s 45 percent. Bunge saw profits of the last quarter of 2007 increase by 77 percent compared with the same period of the previous year. ADM, the second largest grain trader in the world gained a 65 percent rise in profits to a record US$2.2 billion. Thailand’s Charoen Pokphand Foods, a big player in Asia, predicted a revenue growth of 237 percent for 2008. Deregulation in the agricultural market is worse than the financial market, as the Organic Consumer Association points out ; while US Federal Reserve and central bankers across the globe still maintain the ability “to soften the spikes and plunges of our monetary system”, no such buffer exists in food markets. Grain reserves that helped stabilize prices for centuries have been allowed to drop, and are now at their lowest in three decades. After the mortgage crisis that tumbled stock markets across the world, investors put their money instead into commodities, and to cash in on the new biofuels boom. Grain traders started withholding supplies in the hope of higher prices, knowing that grain reserves were down, and prices volatile. At the same time, speculative investors began hedging their bets on grain futures, driving up prices even further. The biofuels boom has exacerbated speculation and high prices, but that boom would not have been possible without a deregulated global market . Deregulation has brought even bigger players to the derivatives market, the big investment banks. Steve Suppen of International Institute for Agriculture and Trade Policy points out that these big, unregulated, financial institutions – non-commodity users – now dominate the commodities markets much more than the commodity users [12, 13]. In March 2008, Goldman Sachs (charged for fraud over sales of ‘toxic’ mortgages ) and Morgan Stanley owned 1.5 billion bushels of Chicago Board of Trade corn futures contracts, while all the regulated hedgers together owned only 11 million bushels (a ratio of 136:1). These investment banks operate through commodity index funds that bundle together up to 24 agricultural and non-agricultural commodities in a single investment portfolio that usually bets on prices to go up. As the component contracts are about to expire – 90 days for agricultural futures, six months for non-agricultural commodities – the banks sell the contracts to take profits, creating price volatility in the wake of selling. Since 2003, commodity index speculation has increased 1 900 percent, from an estimated $13 billion to $260 billion. Economist Christopher Gilbert at the University of Trento in Italy  is among those calling attention to these unregulated index-based investment in commodity futures that controlled 33 percent of all US agricultural futures contracts in 2006-2008, but are not yet incorporated into academic market models. In June 2008, financier, philanthropist and author George Soros testified to US Congress that investment in instruments linked to commodity indices had become the “elephant in the room”, arguing that they might exaggerate price rises . The commodity-index investment funds, though the sheer amount of money involved, both increased commodity prices and made them so volatile that many physical hedgers such as grain importers, particularly from developing countries, could no longer use the futures markets to manage price risk . The UN Food and Agriculture Organization estimated that the developing country’s food import bill rose from $191 billion in 2006 to $254 billion in 2007. “Investment banks play the market not to manage inherent commodities price volatility (e.g., weather related), but to induce volatility through huge “bets” allowed by financial services deregulation.” Suppen writes . 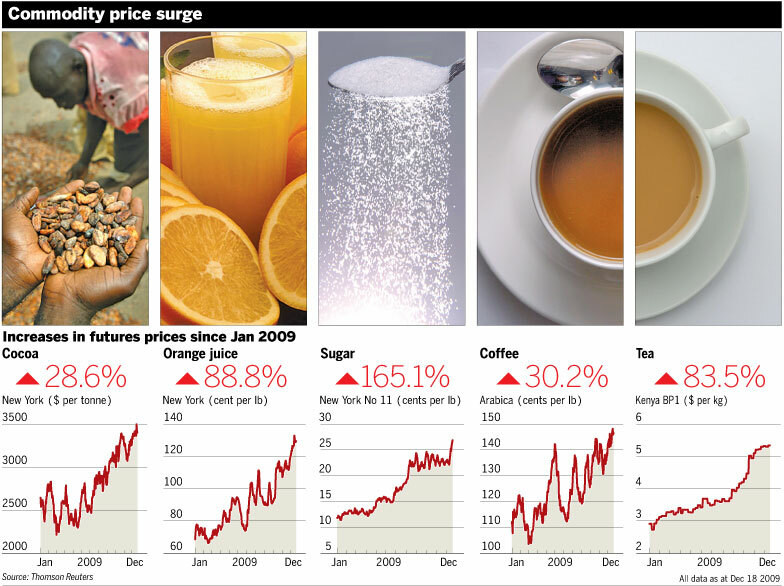 Commodity prices rose with their bets until July 2008. When aggregate commodities prices fell from their July peak by 60 percent in mid-November, these banks lost their bets, and had to ask the government for taxpayer bailouts. By then, according to The Wall Street Journal, commodities speculation had contributed $1.5 billion to each investment bank , about a third of their projected net income in 2008. In May 2008, the newly appointed chair of the Commodities Futures Trading Commission (CFTC) Gary Gensler, a former Goldman Sachs partner, proposed new regulatory measures on over-the-counter (OTC) trades, and capital reserve requirements to cover losses. OTC trades take place between private parties; they are unreported and not cleared on a public, regulated exchange. An estimated 85-90 percent of non-commercial investment (by investment banks) in commodities markets occurs through OTC trades, about which the CFTC has no data and over which it has no authority. In other words, the CFTC has little or no information on the quantity of OTC contracts and the credit-worthiness of the parties to those contracts; so insolvent parties may well continue to depend on the government to bail them out of their imprudent trades. Goldman Sachs and Lehman brothers were among a handful of banks that were exempted from prudential capital reserve requirements in 2004 by the US Securities Exchange Commission. This led to extremely high debt ratios relative to reserves and other equity holdings. Under Gensler’s proposal, OTC trades are still allowed, but the criteria for reported price risk managements between private parties will be tightened; at the same time capital reserve requirements to cover losses will be increased. The UN Conference on Trade and Development (UNCTAD) has gone one step further, calling for an international agreement to prevent excessive speculation in commodities markets. The agreement could be financed by a Financial Transactions Tax (FTT), which if applied by national exchanges to the commodities futures share of all financial transactions in 2007 at a rate of .01 percent, would have generated about $10 billion. An FTT would have an added benefit of reducing the frequency of trading, one of the drivers of price volatility. To put world trade commodity in perspective, the total world grains output in 2009 was 2 122.99 Mt, of which only 275.59 Mt, i.e., 13 percent was traded on the global commodity market . It is absurd that so much taxpayers’ money and bureaucratic effort is dedicated to global trade and its regulation, which end up profiting agribusiness and big banks and starving people, many of whom the very farmers and farm workers that produce the grain. Of the one billion hungry, half are small farmers, a quarter are landless labourers working on plantations and the rest are urban poor who have migrated from rural areas because they can no longer find a living there . Governments and inter-governmental agencies need to devote much more effort towards promoting self-sufficiency in food and sustainability in agriculture instead of trade, or only promoting trade when the food needs of its own people are satisfied. Food and energy self-sufficiency should be the most important step to sustainable development (see  (Sustainable Agriculture and the Green Economy, paper presented at Multi-year Expert Meeting on Commodities and Development, 24-25 March 2010, UNCTAD, Geneva, available for download here). Governments need to put in place a variety of policies and practical action programmes that support small-scale organic, agro-ecological farming, improve access to land and land tenure for small farmers, encourage local production and consumption for both food and green energies, recover indigenous crop varieties adapted to local conditions and hence much more resistant and resilient to climate change than industrial monoculture crops, stimulate local markets and help establish consumer-farmer cooperatives, and promote regional trade and cooperation in sharing resources and knowledge. I have been trying to look into the reasons for the push for GM animal feed here in the UK. I discoverd a DEFRA report where advice had been obtained by a company called Promar. The Promar site made interesting reading. Attached is a list of their clients. Promar International is part of Genus plc, the world’s largest animal breeding company, Here are a list of Genus’ advisors, it includes Barclays.http://phx.corporate-ir.net/phoenix.zhtml?c=130998&p=irol-advisors. I would be interested to hear if people thought Promar were best placed to give independent advice. Link to Promar website: http://www.promar-international.com/Content/meetfood.asp.